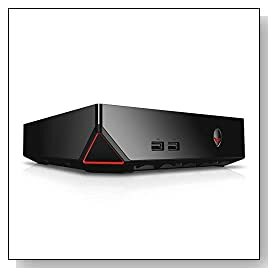 Black Alienware Alpha ASM100-1580 is a PC Console designed to be a low cost yet powerful gaming desktop computer with a decent 4th generation Intel i3 processor, a hybrid drive- HDD and SSD for storage and speed and good amount of memory to run applications at once. It comes shipped with just the Console box and the X360 gaming pad, but this is a Windows 8.1 system so you can also use it as a proper computer by connecting a wireless keyboard and a mouse. However this is not an everyday things computer and can handle more complex tasks such as advanced games and multimedia thanks to the custom built NVIDIA Maxwell GTX GPU. Alpha ASM100-1580 Console is offered with a dual core Intel i3-4130T processor (3MB cache) at 2.9 GHz speed with hyper threading so two cores can handle four threads in parallel, 4GB DDR3L RAM at 1600 MHz is adequate and acceptable for running several applications at once and can be expanded up to 8GB, a hybrid of 500GB SATA hard drive at 5400rpm rotating system and 32GB Solid State Drive (you get both the speed and good amount of space for your game and multimedia storage) and 64-bit version of Windows 8.1 operating system. Intel i3-4130T is a good CPU with a Passmark benchmark score of 4166 and a CPUBoss score of 7.4 out of 10, so it does quite well overall and offers excellent value for money. As the system is designed mainly for advanced gaming- ‘PC gaming in the living room’, you’ll find a dedicated graphics card- Custom Nvidia Maxwell GTX with 2GB GDDR5 video memory inside that performs so much better than any integrated Intel graphics card and lets you run whichever game you want fluently in settings ranging from medium to high in Full HD, despite the lack of an i5 or i7 CPU here. Intel HD 4400 built-in graphics card also comes with the i3-4130T CPU and offers up to 30% better performance than the Intel HD 4000. You can download games directly to the Alpha or from your smart phone wirelessly. With the Steam Big Picture you will find millions of other users to play with on Steam at any time (currently more than 100 million Steam users globally), using the xBox 360 gaming pad in the comfort of your living room and on your large screen HDTV and you won’t need to pay any subscription fees when you’re playing from Steam library and streaming games from Steam network. Black Alienware Alpha weighs	4.4 pounds with measurements of 7.80 x 7.80 x 2.10 inches and it is quite portable- you can take it anywhere unlike other traditional desktops. You will only find the system unit and the gaming pad as the main input device but not a monitor, keyboard or mouse. There are no speakers on the box (you get sound from your TV), no digital media card reader and no optical drive so you can’t really get games through these but you can always use an external DVD drive which doesn’t cost a lot. You’ll find the fast Intel Dual Band Wireless-AC 3160 LAN- 802.11ac wireless, Bluetooth 4.0, Gigabit Ethernet with RJ-45, 2 x USB 3.0 ports and 2 x USB 2.0 ports, an HDMI port. As this is a powerful Windows 8.1 desktop PC, you can always connect a wireless keyboard and mouse and use it for your daily tasks too. As this is designed more with gamers in mind rather than PC users, connectivity options are a little limited but it is easy to upgrade the system memory and hard drive if needed. Conclusion: Alienware Alpha ASM100-1580 is a decent gaming computer with a capable CPU and the NVIDIA Maxwell graphics card at a budget price so Dell engineers seem to be successful at filling a gap here, with the world’s first PC gaming console that can run almost all games just fine at medium to high settings: Intel i3-4130T processor, 4GB RAM, 500GB HDD + 32GB SSD, Windows 8.1 OS, more advanced 802.11ac wireless, Bluetooth 4.0.. You have the system unit in the box, a power cable, Wireless Xbox 360 controller with USB adapter and an Owner’s manual. 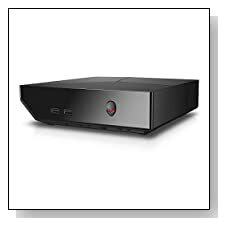 Without needing a keyboard and a mouse, system will start with a unique interface that can be controlled with just the xBox 360 gaming pad. It is a compact unit that works quietly while offering powerful gaming performance at 1080p FHD. It is also designed to be a unit that is easily accessible by the user to upgrade the hard drive, memory and even CPU for better gaming or overall performance, better multitasking and more space to store your games. It comes with a 12 month standard limited warranty for parts and labor, with the return for repair for non-accidental damage policy. If your main purpose of using a PC is gaming and you still want to be able to perform other computer tasks and you’re on a budget, this is a great system to consider.